Dean Harrison celebrates his victory in the second Supersport race at the Isle of Man TT in June. Top international road racer Dean Harrison will return to the Bennetts British Superbike Championship in 2019 with the Silicone Engineering Kawasaki team. Harrison, who won this year’s second Supersport race at the Isle of Man TT, has made solid progress in BSB after becoming a regular on the grid in 2018. Bradford man Dean Harrison on the Silicone Engineering Kawasaki at Gorse Lea in the Supersport class at the Isle of Man TT. The Bradford man says he has benefitted greatly from combining the short circuit meetings with the major international road races, with the fruits of his labour demonstrated in his results. Towards the end of this season, Harrison was staking his claim for top ten finishes in BSB and he hopes to build on those performances next year. Harrison said: “I really enjoyed the racing in 2018 and I’m really happy that we are doing more rounds of BSB next year. I think the proof is in the pudding and the results we had this year showed that racing against the top class riders in BSB has helped massively. 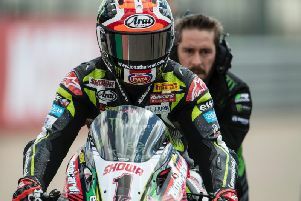 Team Manager Paul Iddon said the extra track time gained from competing in the British Superbike Championship also helped the overall development of the team. “We have delivered one of our most successful seasons of racing this year and that is something that we obviously are looking to build on again in 2019,” he said. The first BSB round will be held at Silverstone from April 19-21.